It’s 3 o’clock on a Thursday afternoon and the Lincoln Park Starbucks is full of DePaul students doing their homework. Casually nondescript sophomore film student and Lake Forest High School graduate Belle Smith, in a well-worn vintage sweater and jeans, book bag in tow, and brown hair messy from the wind, fits right in. But then she opens her laptop to show you the film she shot last week and all regular-girl assignations smash right through the plate glass of that boring front window. Watch with me now: We are in famed fashion photographer Patrick Demarchelier’s New York City studio. Belle’s camera slowly pulls away, capturing a rich, slow motion portrait of Brooke Shields. Then we are looking into Susan Sarandon’s huge brown eyes, at Christie Brinkley and Candace Bergen’s laughing faces, and over Laura Dern’s pretty shoulders. We watch Jamie King’s hair blowing, the thunderbolt on her right cheek and necklace from her late husband David Bowie flashing. The camera slowly pans over Carolyn Murphy in a giant, red hat and plunging-neckline dress. And there are shots of Emily Ratajowski, Alexa Chung, Ashley Graham, Karen Elson, and Amber Valetta. But best of all? We watch a playful Sally Field, happy-dancing in a glittery Miu Miu gown, each of the shiny spangles of her dress jumping, glowing, shaking as she shimmies. The short film is effortless, beautiful, fresh, easy. The image sequences stick, making you want to watch again and again. Which we do. Wait. Patrick Demarchelier’s studio? A dozen female film icons staring down the camera of a 19-year-old Chicago film student? How did this happen? In fact, the last six months of Belle Smith’s life have been a series of dreams come true. “It started this past fall,” Smith recalls. 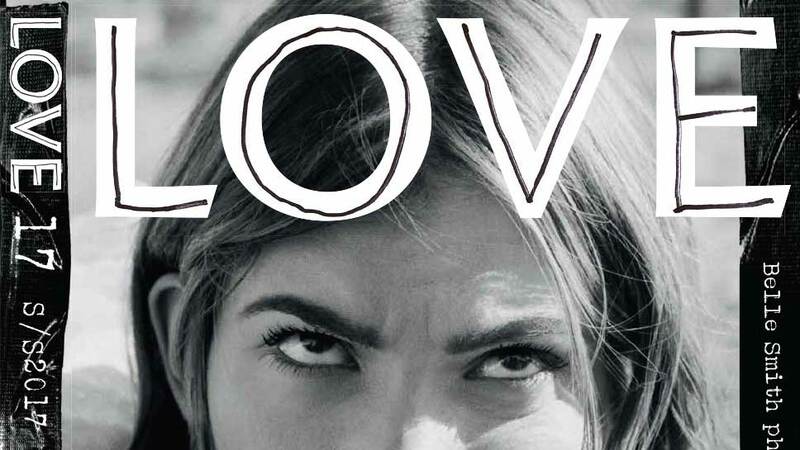 She was sitting in math class in Lincoln Park when LOVE magazine put up an Instagram post promoting their Loveme17 contest where Kendall Jenner (yes, the Kardashian mega-model Kendall) would shoot 20 girls and guys that LOVE hand-picked to feature in the magazine. Over the next week Smith made three videos for LOVE. Each one full of Smith’s magical goofiness and fun. Sure enough, they caught the attention of Katie Grand. “LOVE asked me to do one more video just talking about myself and who I was and then flew me to Los Angeles as one of the Loveme17 girls for their 17th edition,” says Smith. The shoot itself, done in the middle of the California desert at an abandoned film studio frequently used for fashion shoots, was surreal for Smith. As well, some of the other contest winners included Gwendolyn Christie from Game of Thrones, Hair Nef, Hailee Steinfeld, Kaia Gerber, and Joyjah. “It was unbelievable to be hanging out with them,” Smith marvels. The icing on top? One of the shots Kendall took of Belle was used on the cover of the magazine. “But my favorite part,” says Smith, “was when Katie asked me to come on set for the second day and shoot video. I got to direct Selah Marley and Gwendoline Christie as well as direct multiple moments after Kendall was done shooting photos.” LOVE featured the behind-the-scenes film Smith made online. It was the beginning of a whirlwind of LOVE magazine shoots that launched Smith into the unusual international fashion filmmaker/college student dual existence she now lives. London, Paris, Milan, New York … Belle is on a plane almost every week, and still keeps up with college classes. The day after finishing the LOVE shoot in the desert, she was invited to London to shoot on set with Tim Walker, one of Smith’s favorite fashion photographers. Following that, she shot behind the scenes film for LOVE in Milan with Fendi, Armani, Prada, and Versace, flew to Paris for Miu Miu and Ronald Van Der Kemp, and then made a behind the scenes short film for Marc Jacobs that was featured on the banner of the designer’s website for a month. On that same shoot Smith was asked by Grand to model. Most recently, Smith documented New York Fashion Week, capturing behind the scenes video for Lacoste, Alexander Wang, Diane Von Furstenberg, Altuzarra, Oscar De La Renta, Philipp Plein, Coach, Anna Sui, and Thom Browne. The freelance films Belle does for LOVE also put Belle on the radar of these brands and more. But although the starry splash Smith made with LOVE magazine started six months ago, her roots in creative video storytelling go back to childhood. Growing up in Lake Forest, she says she was always intense about art, drawing and making projects that would go for days. “I used to borrow my mom’s hand-held Canon Powershot ELPH 3060, to make my early movies,” she recalls. Smith’s father’s career took the family to Singapore during Belle’s fifth and sixth grade years, and then again to Helsinki, Finland during her freshman and sophomore years of high school. “It was a time of who am I, really, and what do I want to do with this life?” she says. Shifting the intensity back to her long-loved art, Smith started making fashion films combining her drawings, fashion, and loopy storytelling style, and launched her own YouTube channel in 2012. At the time, the films were groundbreaking, sparkling little whimsies that captured the imagination of a huge group of followers: within a month of launching her channel, Smith had more than 12,000 followers; 21,000 within a year and a half. Moving ahead, Smith says she wants to keep filmmaking her primary artistic platform, despite the challenges international shoots place on her busy life.